Forgive the low light pic dear reader, but I made this one in the sweet dark night. The next day I served it warmed through and crispy for a light lunch. It went down a treat. Enjoy it, it’s a fun one to make and quick too. 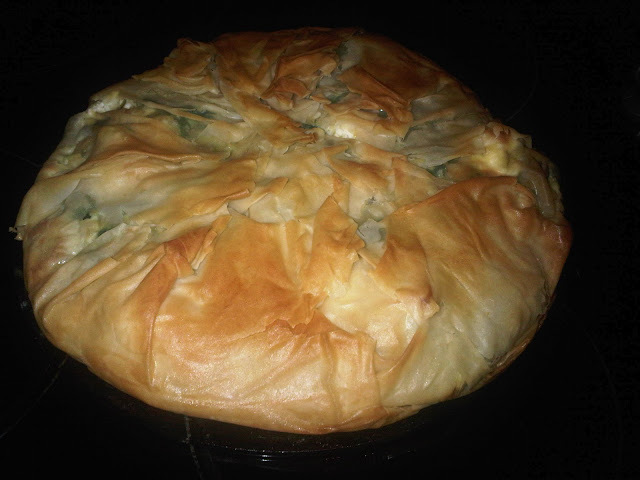 You can’t fail to enjoy the contrast of flaky, buttery filo with the softness of feta and spinach and then the faint crunch of milky pine nuts within. You can also add butternut squash if you want some extra colour and texture, it works really well here. Pastry brush for brushing the melted butter between the sheets. Spring form cake tin, 15inch. Sweat off your spinach in a large saucepan on a medium – high hob with the nutmeg and a large knob of butter or olive oil. Once it’s reduced in size and still bright vivid green, drain it and set aside in a different bowl to cool. In the same pan, put some water on the boil ready for the squash. Chop the squash into 2cm pieces and boil until tender but not mushy. Drain and rinse the squash in cold water so it cools quickly. Dice the feta into large 2cm pieces. In the mixing bowl, add your cooled spinach, squash and feta, then beat your eggs and add into the mixture, adding extra seasoning as you go. Add the pines nuts too. In your cake tin, brush a little melted butter on the bottom and sides to prevent it sticking. Add the first sheet of pastry then brush the top of the first pastry sheet as well. Add the next sheet at a different angle so it forms triangles at the edges, brush with butter and repeat for the remaining sheets. This ensures a crispy crust as the pastry doesn’t get sodden with the ingredients. Assemble the pie by adding your mixture to your pastry sheets and pulling (without stretching) the top ones over the mix. Brush liberally with more butter and bake straight away for 15-20 mins in your oven or until the pie (egg) has set) and the pastry is a beautiful golden brown. A fabulous crowd pleaser and the pie is definitely best served warm with a good salad and a sharp lemon dressing to cut through the rich feta and spinach mixture. Also includes one of fussy eater's favourite spices and in my view one of the least well used in this pleasant land – nutmeg. Yum.